A suspect died Tuesday after being shot by two police officers in Concord following the stabbing of a man as well as a police canine who responded to the scene, a police spokesman said. Officers responded at about 2 p.m. Tuesday to a report of a stabbing in the 2900 block of Crawford Street, Concord police spokesman Cpl. Christopher Blakely said. About a half-hour later, officers located the suspect, later identified as 30-year-old Dominick Musulman, a resident of Antioch, in the backyard of a home not associated with him in the 1400 block of San Jose Avenue, near Prospect Street and only a block from the Concord BART station. After giving the suspect orders to surrender, officers sent a police canine named Jelle in to try to subdue the suspect, who used some sort of garden shears to stab the dog in the face, Blakely said. Blakely said he didn't yet have the details about what happened next, but two officers shot the suspect, who was taken to a hospital with multiple gunshot wounds and later died. Longtime resident Esperanza Simon said the stabbing victim was rushed to the hospital. She had no idea the suspect would end up only a few blocks away. "He’s screaming somebody tried to kill me, somebody tried to kill me and run that way," Simon said. Witness Marjan Wadan described the scene at her house on San Jose Avenue. "I was in my living room. I saw someone run into my backyard," Wadan said. "I was like, who is that? It happened so fast." The victim in the initial stabbing, which involved a weapon other than the shears, is in stable condition at a hospital, Blakely said. He said the suspect, a man in his 30s whose name is not yet being released, had prior contacts with police. He didn't immediately know more details about the initial stabbing, which occurred outside of a home. 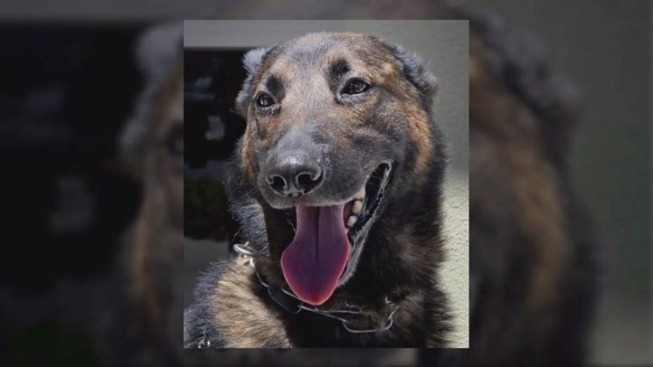 The police dog Jelle underwent surgery at a veterinary hospital and is expected to be OK, Blakely said. The two officers who shot the man both had more than 10 years of experience with the Police Department and are being interviewed about the incident by investigators, Blakely said. While what immediately preceded the shooting remains under investigation, Blakely said the fact that the dog was stabbed would not by itself warrant an officer to open fire. "As much as we love our dogs, a police canine is not considered an officer," he said. "Officers aren't going to shoot just because the dog is getting stabbed." NBC Bay Area's Robert Handa and Cheryl Hurd contributed to this report.